School meals are provided by ISS Education and cost £2.15 each. 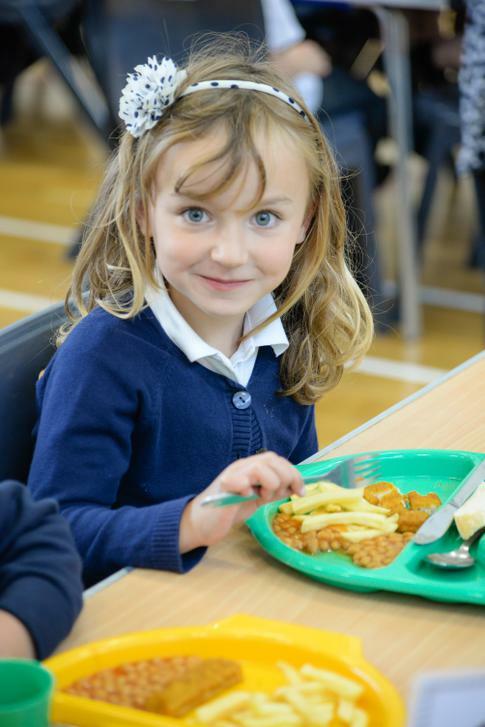 From September 2014, all children in reception, year 1 and year 2 state-funded schools in England will receive free school meals. The aim is to improve academic attainment and save families money. All parents are requested to complete a registration form in order for us to identify whether you would have been entitled under the existing free school meals scheme or not. This is because each child registered under the original scheme attracts valuable funding for their school. £1,320 for each eligible primary-aged pupil will be allocated in the next school year in additional funding. If you have not already completed a registration form, copies are available from the school office. • Child Tax Credit, provided they are not also entitled to Working Tax Credit and have an annual gross income of no more than £16,190, as assessed by Her Majesty's Revenue and Customs. Children may, if they wish, bring a packed lunch, instead of the cooked meal. These are eaten in the classroom under the supervision of a mealtime assistant. Cans/bottles of fizzy drink should not be brought into school. Children are not allowed to eat crisps, sweets etc. except with their packed lunch. If there is a need for a snack at break time they are allowed to have fruit.